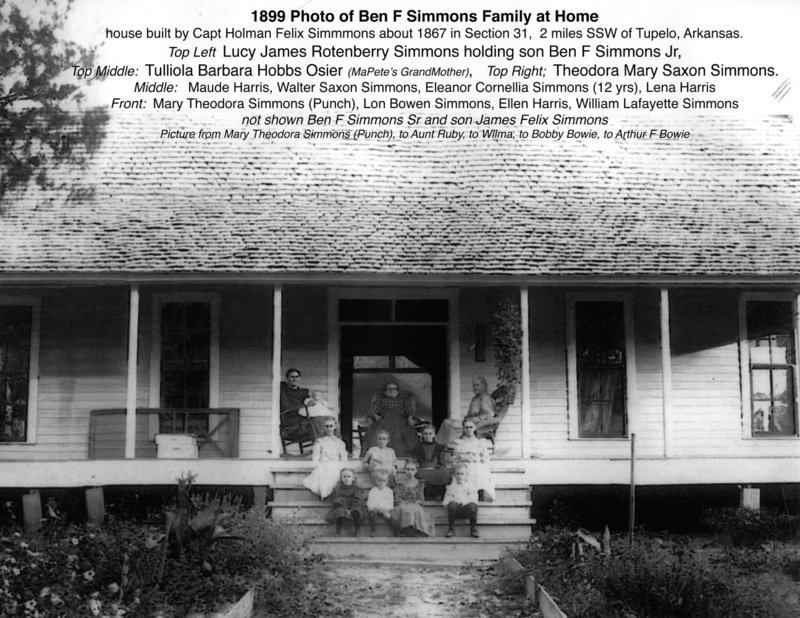 Lon was born on 1 FEB 1895 in Tupelo, Jackson County, Arkansas, the son of Benjamin Fletcher Simmons and Lucy James Rotenberry. He died on 12 NOV 1963 in Tupelo, Jackson County, Arkansas. 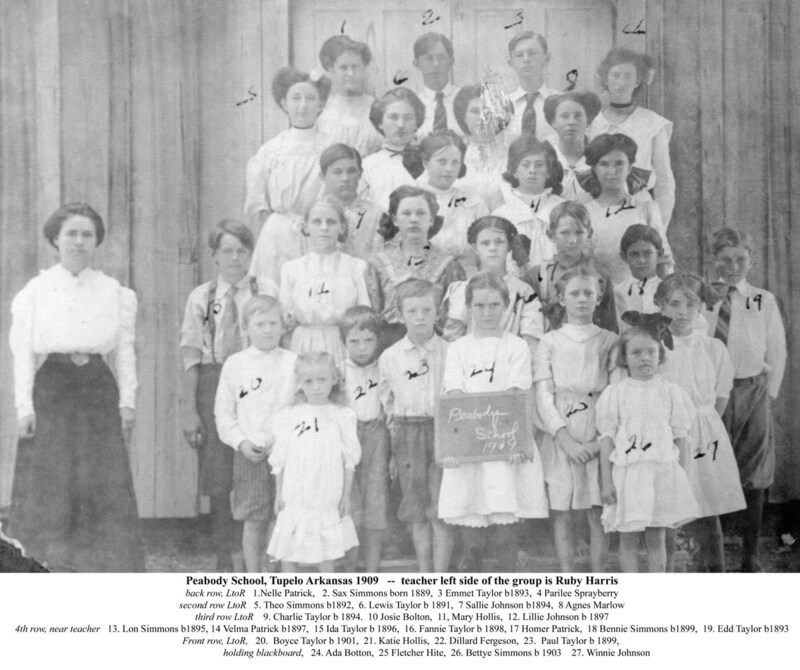 His wife was Dollie Gertrude Bleakley, who he married on 2 NOV 1919 in Jackson County, Arkansas. 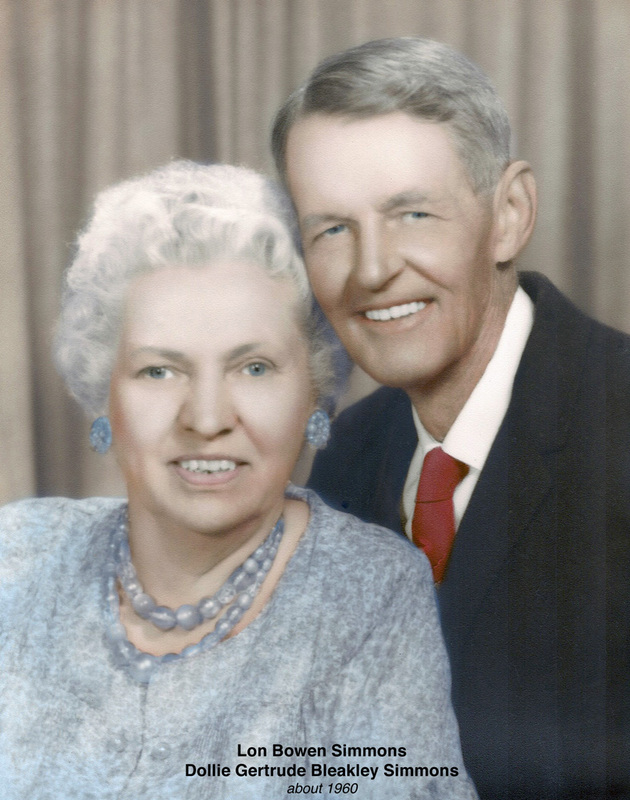 Their six known children were Geraldine S (1921-2005), Jamie Edwina (1924-1990), Mary Ann (1930-1987), Virginia Lou (1932-1982), Lucy Faye (1934-1984) and Lon Bleakley (1944-?). Lon was awarded the Purple Heart for his service in WWI. He only talked about his war experiences once with son Lon Blake, so the story is sketchy. He served in France near the border with Germany and Belgium. His unit was specialized and worked behind the lines blowing up bridges and were ambused and attacked with mustard gas. Lon was shot thru the side, listed as missing in action and presumed dead, but was actually captured and escaped after about two weeks. Because of the gas exposure, his lungs gave him trouble the rest of his life. He died of cancer. Lon and Felix fished together a lot in later years. 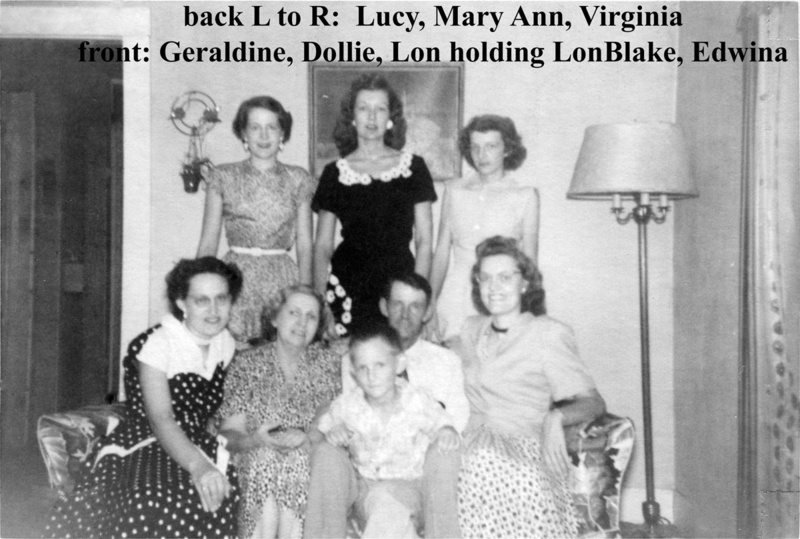 When Lon Blake was young he was walking with Father Lon and a black hired hand along the street in Tupelo near Bowen's? store. A man who was sitting on the spitting and whittling bench stuck his leg out and tripped the hired hand. Lon immediately swung a left upper cut which knocked him over the bench. Lon threatened to kill the man if he ever bother the hired hand again. Another strong memory is that Lon was an avid quail hunter and dog trainer. He trained setters and pointers for himself and for people from all over the state. He was excellant shot with his shotgun and at times would bring home more quail than shells fired. Lon Blake remembers following his father thru the fields when he was very young, maybe 5 to 7 years old, well before he was allow to hunt. 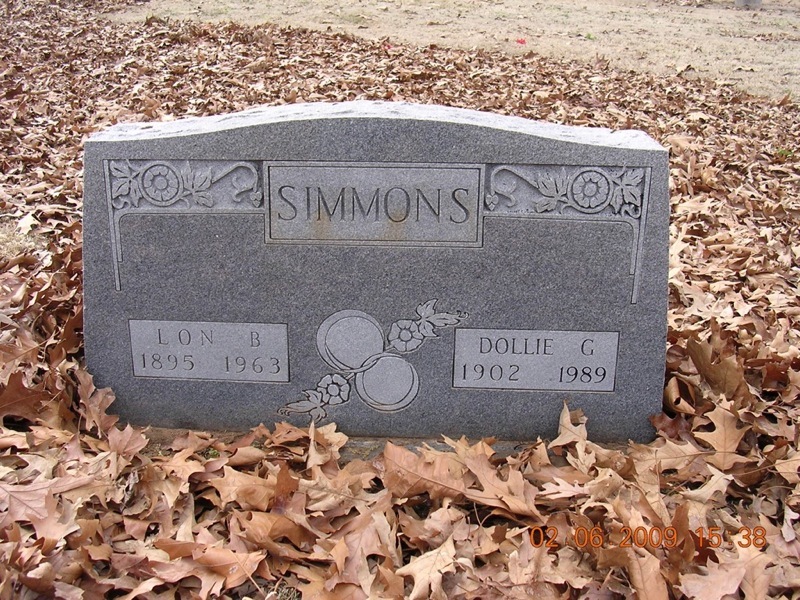 Lon Bowen, age 83 is with Uncle Robert and Margery Simmons in 1930 census. probably namesake? June Jackson Simmons We used to say it was called Simmons switch because the girls switched from one Simmons to another. Lol. Back in the day? Jim Simmons On your map. 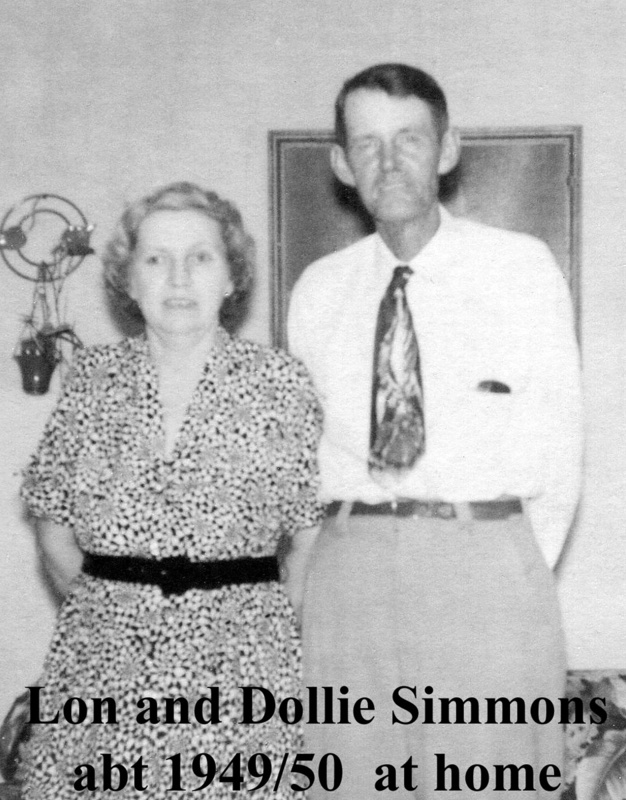 When I was born, and growing up, Lon and Dollie lived on the west side of hiway 17 right on the Jackson county side of the Jackson/Woodruff county line. They moved south of Tupelo where you have them marked sometimes in the late 40's. Jim Simmons Another interesting thing I remember about Ben. When I was about 4 or 5, I was walking down the county road in front of our house and old Ben came up behind me and hooked my ankle with his cane. At that time we lived just south of his house at the place known as "The Big Barn". My dad was the farm foreman for Alcorn Ferguson.